We have a Yamaha 4AC outboard, old but sturdy little fella that gets us to the beach as quick as you can .. Erm, read War and Peace! But hey, its a 4hp outboard so what do you expect?! We had to pay a small fee to get hold of the workshop manual, I’m sure you can find it for free somewhere on the web, but it came down to $10 versus another hour looking, and, well, we aint that poor yet! Only one good supplier found so far, but then we haven’t needed too many parts and fingers crossed that carries on. 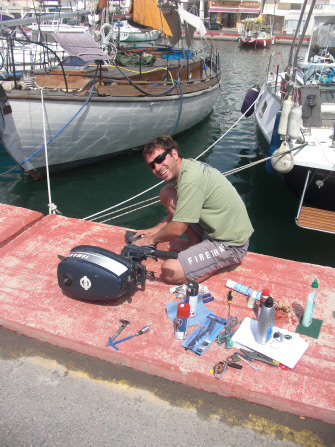 Based in the Netherlands, we found Outboard Klijzing to be very helpful indeed.